You guys probably already know how much I loved Lindsay Smith's debut, Sekret, as I've been talking about it for some time now. [You voted for a super-early review of it, which I was happy to provide, but that didn't keep me from bringing it up at every chance...] And you might as well get used to hearing about it, 'cause guess who's part of the Sekret Street Team? THAT'S RIGHT, THIS GUY. Err. You know what I mean. 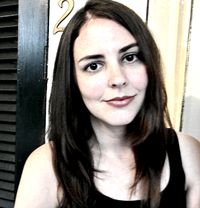 Anyway, I'm going to keep telling you all my sekrets (heh) over the next few weeks/months/lifetimes, but in the meantime, Lindsay has dropped in to tell us some of her own. Check out her sekrets to bringing Yulia's story to heart-pounding life in the piece below, and then enter to win a shiny new copy of Sekret for yourself! Whether it’s historical fiction, fantasy, or even contemporary, a story never happens completely in a vacuum. So many tales and histories lie just beneath the surface of characters’ thoughts, informing their choices, coloring their perspectives, and even foreshadowing their future. In Sekret, Yulia’s ability to read thoughts and memories by touching objects as well as people makes her a valuable tool for the KGB, the USSR’s spy agency and secret police. While the immediate past hovers closest to the surface, anything with strong emotion attached to it, like major events, resonate as well. Yulia’s power gives her glimpses of Russia’s tumultuous history, which echo patterns and themes about the Soviet Union and the Russian spirit that weave tightly around her present life, and loom large over the story as well as Russia as a whole. Russia’s transition from a rigid caste system under imperial rule to the strict, managed economy of the Soviet Union was a bloody and frightening one. The nobility surrendered their homes and possessions, but most were sent to hard labor camps or executed. Some tried to stash their belongings in secret compartments in their homes, like the passage Yulia and her fellow psychics, but in the famine and chaos of the early Soviet days, the state confiscated and sold many priceless works of art and jewelry, leaving behind the stripped-down houses like the one in Sekret. Under Josef Stalin, the ideological purges and swelling police state ingrained Russians with the fear and paranoia that permeated the rest of Soviet times. Though millions of Russians and non-Russian minorities living within the Soviet territories died under Stalin, Hitler’s betrayal of his non-aggression pact with the USSR altered the course of World War II (known as the Great Patriotic War in Russia) and sparked a major cultural touchstone for Russians that continues today. For all his cruelty, Stalin’s legacy is tempered in the national psyche by his defeat of the fascist betrayers. Millions of Russians gave their lives in the siege of Leningrad and on the battlefields of Eastern Europe, and their ghosts hung thick over the Cold War decades that followed. Nikita Khruschev, the Soviet leader who followed Stalin, tried to acknowledge and apologize for Stalin’s atrocities, and took some steps to ease the tensions that had mounted between Russia and the West in the aftermath of World War II. But his erratic decisionmaking and infamous temper led to a number of stressful confrontations between the nuclear-armed states—the Cuban Missile Crisis, the U2 spy plane incident, the space race, and more. These recent histories, too, shadow Yulia’s search for truth, and spark an internal struggle between Stalinist old guard within the USSR’s leadership and the newer, gentler Communist Party elites that threatens the uneasy truce between Russia and the West. History is never a single snapshot—so many threads run underneath, suggesting a pattern, offering up recurrent colors and shapes for us to weave together into something new. I love exploring the tapestry of history, and finding fresh ways to weave them together. For Yulia, too, the currents of the past just might offer hints of a future she hadn’t yet considered. To celebrate the release of Seket, the awesome folks at Macmillan have offered up a finished copy of the book to one lucky winner! US/CAN only, ends Arpil 8th at midnight. Fill out the Rafflecopter to enter, and please do not leave any sensitive info or addresses (mailing, email or otherwise) in the comments. 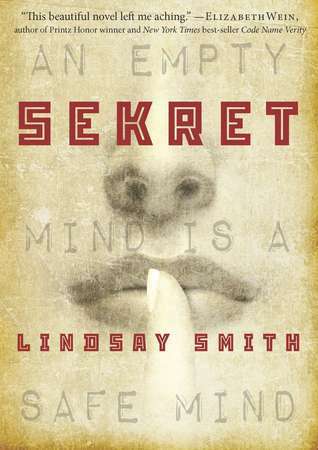 From debut author Lindsay Smith comes an espionage thriller with a dash of both history and dystopia. Yulia's father always taught her that an empty mind is a safe mind. She has to hide her thoughts and control her emotions to survive in Communist Russia, especially because she seems to be able to read the minds of the people she touches. When she's captured by the KGB and forced to work as a psychic spy with a mission to undermine the U.S. space program, she's thrust into a world of suspicion, deceit, and horrifying power where she can trust no one. She certainly can't trust Rostov, the cruel KGB operative running the psychic program. Or handsome Sergei who encourages her to cooperate with the KGB. Or brooding Valentin who tells her to rebel against them. And not the CIA, who have a psychic so powerful he can erase a person's mind with his own thoughts. Yulia quickly learns she must rely on her own wits and power to survive in this world where no SEKRET can stay hidden for long. And make sure to catch her on the Fierce Reads Tour! What an excellent guest post. I am utterly fascinated with the Russian history. I'm German, so automatically everything German already interests me. Realizing there are threads everywhere is such an eye opening experience. Now I'm even more excited to read Sekret! This book is already on my list of "READ IMMEDIATELY" but after Lindsay's guest post now I'm even more excited! I'm such a huge Russophile and this period of there history has always particularly excited me. I'm so pumped for a Historical Fantasy/Mystery set in this period! Thanks for the outline of Russian history. The way it is woven into the story sounds really interesting, I'm looking forward to the book very much. I want to read Sekret because it sounds like the premise for the book is very unique and interesting,l particularly for the YA genre, which frankly is saturated with too much of the same thing (in my opinion). Also, there should be more fiction books set in Russia! Fascinating country! I love the synopsis . Looking forward to reading Sekret. I am so excited to read this book. Your video sold me and everything I've heard subsequently has made me more and more excited. Because their history evolved so differently than that where I live- though I know everything is interconnected, I've always been fascinated by Russian history. This book, Sekret, sounds brilliant. Thanks for the thought provoking post and giveaway opportunity. And congrats, Misty on becoming a Street Team member! Thanks for telling us about Russian history! I don't really know much about it. I love historical YA, but it sounds so much better with super powers! Very intriguing concept to read about! Can't wait for a copy. I love Cold War spy novels. Russian history is fascinating - thank you for this little history lesson. There's a lot of tension when political systems change, and it's awesome that this is reflected in the spy story! !